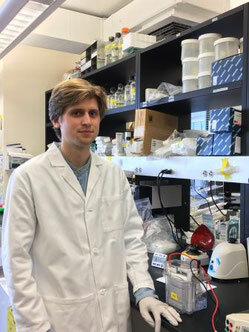 "My time in Boston has been very transformative in many ways, and has enabled me to take a big step forward towards my goal of becoming a physician-scientist. Among the countless valuable techniques and skills that I learned here, are a variety of biochemical assays, the analysis of high-throughput screening data, and the study of cancer in mouse models. The intensive training in scientific reading, writing, and thinking will benefit me for the rest of my career. Outside my own research, Boston offers the chance to get a first-hand introduction to the science of world leaders in their respective fields, and I attended talks by the likes of William Kaelin, Tyler Jacks, Jennifer Doudna, and Matthew Meyerson. Moreover, I got the chance to experience the excellent clinical work at Boston Children's Hospital, when I shadowed physicians there on several weekends. I had an amazing time at the Dana-Farber Cancer Institute, and am very grateful to the DAAD for supporting me."